Bury striker John Rooney, younger brother of Wayne, has joined Chester on a one month loan and goes straight into the squad who face Barrow AFC on Saturday. The 22 year old forward began his career at Everton before moving to Macclesfield Town where he made 27+19 appearances, scoring four goals. He moved to America before returning to Barnsley and eventually signing for Bury last July making 1+3 appearanaces for the Shakers. Accrington Stanley midfielder George Miller has joined Chester on a one month loan. The City Fans United 2013 Annual General Meeting will take place tomorrow, Thursday 28 November, in the Blues Bar at Deva Stadium starting at 19.30hrs. Members will need their membership card to gain entry on the night. Hospitality v Barrow – This includes a three Course meal, VIP match ticket, stadium tour, programme, access to Legends Lounge and waitress service, half time refreshments and meet the management and players after the match. Price for this is £35.00 but tomorrow night to CFU members booking on the evening the cost is £30.00. Friday 6th December – Evening with Peter Jackson. Question and answer session and a talk about his career as a player and manager. Included in the admission price is a curry and rice/naan bread plus a pint of lager or bitter on entry. Tickets are £15.00 but tomorrow night there is a £5.00 discount for CFU members bringing the cost down to £10.00. Saturday’s poor performance at Nuneaton resulted in a 1-0 defeat for Neil Young’s team. Both sides struggled to find any form in a game that was petering out to an unforgettable draw until Louis Moult stepped up six minutes from time to score the winner for Boro, despite claims by the Chester defence of a handball from him in the build up. Perhaps the bizarre colour clash of all-blue against all-purple didn’t help the officials! Chester named un unchanged team for the visit to Nuneaton but were forced into two first half substitutions due to injuries to Ross Killock (calf) and Gareth Seddon (rib injury). The Blues created only one real scoring chance of note throughout the game when substitute Paul Linwood headed wide from close range 13 minutes from time. Chester are next in action on Saturday when they entertain Barrow AFC in the first round of the FA Trophy. The Bluebirds were relegated from the Conference Premier last season and currently sit fourth from bottom in the Conference North. They have a good pedigree in the competition and lifted the Trophy in 2009/10 beating Stevenage Borough 2-1, and in 1989/90 beating Leek Town 3-0, both games at Wembley Stadium. Leeds United defender Ross Killock is to have his loan deal at Chester extended until 5 January 2014. The defender, who has impressed since his arrival from Elland Road, initially signed for one month. Two of Chester’s promising youth team players have been offered contracts. Tom Peers has signed an 18 month deal and Sean Miller has signed until the end of the season, he is to go to Clitheroe on loan to help further his development following a loan spell at Bootle. Chester will face Conference North side Barrow AFC in the first round of the FA Trophy on Saturday 30 November after the Bluebirds won their qualifying round replay at Stockport County 3-2 last night. Both clubs have agreed to a reduction in admission for the match, the revised prices are: adults £10.00 for anywhere in the ground, under 17-18’s £3.00, Under 16’s £1.00 and concessions £7.00. Chester have been given a home draw against either AFC Barrow or Stockport County in the first round of the FA Trophy on Saturday 30 November. The two sides replay at Stockport tomorrow night following their 2-2 draw at Holker Street on Saturday. Blues manager Neil Young was happy with his sides point against second placed Luton Town on Saturday. For the third time in a week his saw his side come from behind after conceding an early goal. Andre Grey had given the Hatters a deserved lead on 11 minutes after the visitors had started the better side. But Chester dug-in and fought back well. They were denied what looked like a clear penalty after Gareth Seddon’s overhead kick had struck Steve McNulty on the arm but the referee waived the appeals away and awarded a corner. Chester were pressing and equalised on 23 minutes as Seddon hit an unstoppable shot from outside the area giving Mark Tyler no chance in the Luton goal. Craig Mahon and Lewis Turner both went very close to giving Chester the lead towards the end of the opening period. The second half couldn’t live up to the first in terms of excitement of the first though the visitors enjoyed more of the possession. Few chances were created with the best going to Jonathan Smith who lobbed just wide in the final inute. CFU members are being asked to vote for the new home shirt that will be used for the next two seasons. There are five blue and white designs to pick from. The vote is open for a week and will close at 20.00hrs on Thursday 21 November. It is one vote per member. The club are holding a quiz night on Friday 22 November in the Blues Bar, starting at 20.00hrs. Entry is just £1.00 per player with teams having a maximum of four players. The rounds will include questions on general knowledge, music, news, sport, entertainment and more. Hosting the night is Blues Live presenter Phil Turner. Chester edged out of the bottom four on goal difference last night after they fought out a 2-2 draw at Hereford United. The Blues fell behind in the 16th minute as on-loan Mansfield Town striker Ross Dyer headed past John Danby with the help of a deflection, but responded immediately with two goals in a four minute spell to turn the game on its head. First Craig Lindfield scrambled the ball home from close range after Gareth Seddon had pounced on a mistake by the home ‘keeper Daniel Lloyd-Weston. Minutes later a poor clearance from Lloyd-Weston went straight to a Blues player who played it straight through to Seddon who controlled the ball before slotting it past the stranded Bulls shot stopper, who had rushed out of his goal to try and retrieve the situation, from 30 yards out. The equaliser came nine minutes before the break as Dyer once again sent a header past Danby following a free-kick. The home side had the better of the exchanges and chances after the break, with man of the match Danby pulling off a series of fine saves to ensure Chester came away from Edgar Street with a point in front of over 200 travelling supporters. Chester are next in action on Saturday with a tough home game against second placed Luton Town. The Hatters will bring a large following for the game which will kick-off at 15.00hrs. The club are offering free admission to members of the armed forces for Saturday’s match, this applies to both Chester and Luton supporters, as well as those who have previously served, those attending should go to the ticket office where proof of Armed Forces ID will be required to claim your match ticket. Chester will begin their defence of the Cheshire Senior Cup with a first round match away at Runcorn Town. The match is due to be played in the week beginning 13 January 2014. Runcorn Town are currently top of the North West Counties Premier Division. Goals either side of half-time by Graig Lindfield and Craig Mahon, recalled from his loan spell at AFC Fylde, gave Chester victory at Hyde and moved them up a spot to 21st in the table. The match, played on a slippery Ewan Fields surface following heavy rain, saw the Blues fall behind as early as the third minute as Louis Almond raced past the Chester defence to send a shot past John Danby and just inside his left hand post. The home side went on to miss several other chances of note, Scott Spencer lobbing wide a one-on-one opportunity after a slip by Ross Killock, and Chester made them pay with an equaliser five minutes before the break as Mahon crossed form the left and Lindfield headed home from close range in front of the delighted traveling supporters behind the goal. Chester took the lead a couple of minutes after the restart as Lindfield raced down the right and centred to Mahon to control the ball and dink it over the advancing ‘keeper Lawrence Vigouroux. There were loud appeals for a penalty in the last minute as Kevin McIntyre appeared to bundle over Louis Almond in the area but referee Richard Wigglesworth waved play on to the relief of the Blues fans. Chester are back in action on Tuesday night when they travel to Hereford United who site one place above them in the table, kick-off 19.45hrs. The Youth Team were beaten 5-4 on penalties last night in their FA Youth Cup first round match against Chesterfield in front of a crowd of 400. The scores were 0-0 at half-time before Chesterfield took the lead nine minutes after the break through Regan Edridge. Chester continued to play well and create chances and they scored a deserved equaliser on 66 minutes with Tom Peers rounding the Spireites ‘keeper to score and force extra-time. Both sides created chances to grab the winner but the tie was decided from the penalty spot. The first nine penalties were all converted before Tom Batten saw his effort saved by Cameron Mason to win the tie for the Derbyshire side by the slenderest of margins. Chester: Neild, Garner, Batten, Jones, Herbert, Pownall, Williams, O’Sullivan (Blake 61), Peers, Woods, Wilson (Robson 65). Subs not used: Keigan-Jones, Rimmer, Coxall. Congratulations to both Barrie Hipkiss and George Horan who picked up awards at the North West Football Awards on Monday night. Barrie picked up the award for ‘Unsung Hero’, a greatly deserved (and long overdue) recognition for the huge amount of voluntary work he has done for the football club for over 40 years including being matchday co-ordinator and organising supporters coaches for away games. Club captain Horan received the ‘North West Conference Player of the Year’ award after helping Chester to win the Conference North last season. A late equaliser denied Chester all three points from the home match against Aldershot Town on Saturday. On-loan Bolton Wanderers striker Conor Wilkinson had given the Blues the lead midway through the second period with a great strike from the edge of the box. However Chester had to be content with a point after substitute Jaydon Gibbs headed the Shots equaliser in stoppage time. John Danby had made several good saves to deny the visitors up until then. 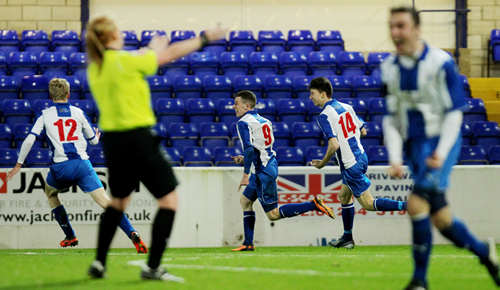 The Youth Team entertain Chesterfield in the first round of the FA Youth Cup on Thursday 7 November. Chesterfield are a full time Football League Academy side. The Kick off is 19.45hrs and admission is £5.00 for adults, £2.00 for concessions and Under 16’s are admitted free. To reach this stage of the competition the under 18 side have recorded away wins at AFC Blackpool, Prescot Cables and Stalybridge Celtic. Manager Neil Young has boosted his squad with four signings, two players on non-contract and two on loan from Bolton Wanderers. The players signing on non-contract are 19-year-old midfielder James Menagh (pictured) from Prescot Cables, he had a trial with the Blues in the summer and played in the pre-season game against Bolton Wanderers, and Charlie Anderson. Anderson, who is the son of former England defender Viv Anderson, has recently been playing at Mossley and is 22-years-old. The two loan signings are 18-year-old forward Conor Wilkinson, who was with Millwall before joining the Trotters and 19-year-old midfielder Chris Lester. Both will be in tomorrow’s squad for the home match against Aldershot Town, kick-off 15.00hrs. The Shots sit one place below Chester but started the season with a ten point penalty for entering administration, but for that they would be sitting comfortably in mid-table. They were surprisingly beaten at home by Shortwood United in their FA Cup replay in midweek and have also strengthened their squad as a result.